For its special vinyl-only Records Store Day 2019 titles, VP Records reaches into its early history and two of its important sublabels. A 7-record box set of 7-inch singles on the collectible Roots From The Yard label highlights the early years of the company, when records were pressed on behalf of independent producers on a variety of sublabels including Roots From The Yard. The set includes tracks from Barrington Levy (“A Yah Me Deh”), Bim Sherman (“Mighty Ruler”), The Mighty Fantells (“Every Where”), Junior Delgado (“Tishan”), Freddie McKay (“I Man”/”Creation”), Earth & Stone (“Wicked Haffe Dress Back”), and Linval Thompson (“Roll River Jordan”). The next title is Nightfall, a deep collector’s rarity from reggae and dancehall icon Johnny Osbourne. Released in 1981 on VP’s Jah Guidance imprint, the album features heavy mixes and extended dubs produced by Linval Thompson, with the Roots Radics band, and engineered by Hopeton “Scientist” Brown. A companion release produced by Thompson, the 12-inch single by Freddie McKay “Another Weekend,” backed with Earl Sixteen’s “Live Together” is featured as a Record Store Day title in Europe on VP’s subsidiary label Greensleeves. The final Record Store Day title is the Roots Radics 12 Inches Of Dub, a spectacular and never before released dub companion to General Echo’s 1980 Greensleeves album 12 Inches Of Pleasure, produced by Henry “Junjo” Lawes, and again featuring the Roots Radics in their prime with heavy mixes by Scientist. 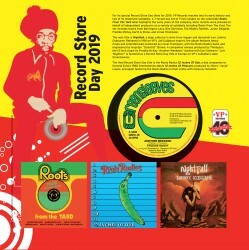 VP Records will celebrate Record Store Day 2019 on April 13th at its flagship retail location on Jamaica Avenue in Queens, New York and its store in Miramar, Florida with a day of special DJ and soundsystem performances celebrating and featuring vinyl records. Events will be streamed live on the VP Records YouTube channel.